This article was condensed from Truro Congregational Christian United Church of Christ 1856-2006 Sesquicentennial Celebration: 150 years of God’s Blessings booklet authored by Donna J. Crow, historian. Additional information on events, history, ministers, church organizations and bibliography is available in the 60-page history booklet. Later in the 1870’s, when school houses were built, worship was often held at these. Bridgeport School (about 2 mi south of Truro), Hartman schoolhouse (1 mile south of township center) and Banner schoolhouse (two miles northeast of Truro) were all used as worship centers at various times. 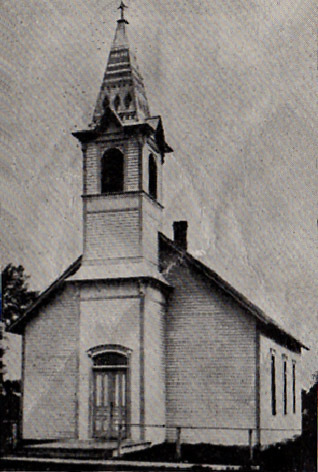 During the years of 1875 and 1876, the Christian Church built its own worship center. The 30’ x 40’ building was erected ¾ mile south of the center of Ohio Township on the west side of the road. In 1881, the first post office in Ohio Township (Reed) was located just ¼ mile north of this church at the home of Isaac Holmes. Later that year at the center of Ohio Township, the town of Ego was “laid off” and plotted for James Hull (owner) by R. A. Patterson, (surveyor). Soon afterward, the narrow gauge railroad came through this new “town”. In 1882 the post office was moved from Reed to Ego; and then the town was renamed Truro in 1884. At this time, the church was moved to a new location just west of the present site. This building was already being remodeled by 1893. It was at this time that a belfry with a glistening aluminum spire was added. On June 22, 1898, the building was struck by lightning and burned, destroying all records. The organ and eight pews were the only things saved. The bell wasn’t damaged and it is the same bell in use today. This was the evening of the first date of Sadie and Sammy Porter. Rev. Lamb was the minister at this time and he died later that summer. One thousand dollars was received as an insurance settlement and was immediately applied towards the new building. This page was created on March 22, 2010.